History was made last week when hundreds of thousands of women and men across the globe marched in protest of the inauguration of Donald Trump. Some also marched in support of the LGBTQ community, indigenous, and women’s health care. Whatever personal reason people had for marching, the main rallying point was to show the new President of the United States that the public are united against him. The American people are taking a stand and they will not be silenced. Not every supporter was able to travel to Washington D.C to be a part of the movement, because of this, sister marches took place in different cities in America, including Helena, MT. 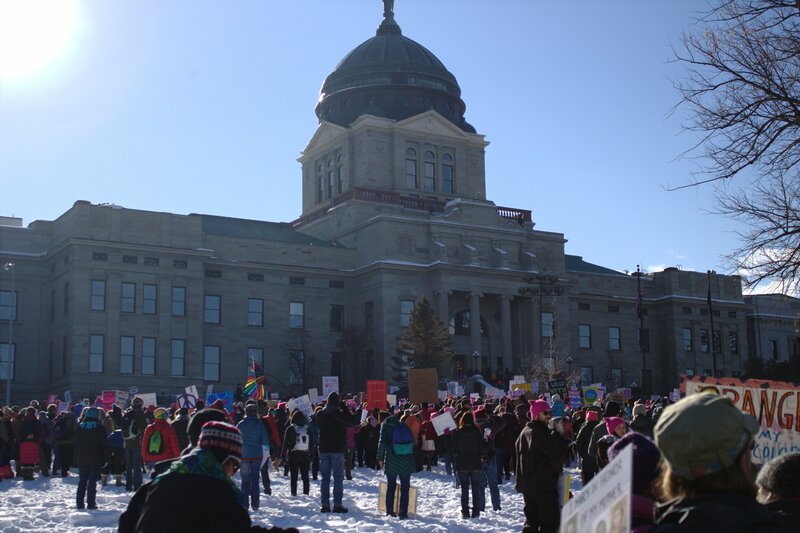 Montanans traveled by car and by the busload to join the march taking place in the state’s capitol. Prior to the march taking place, it was estimated that 4,000 to 5,000 citizens would show up to protest and listen to speakers. It took many by surprise when nearly 10,000 supporters showed up to be a part of history. 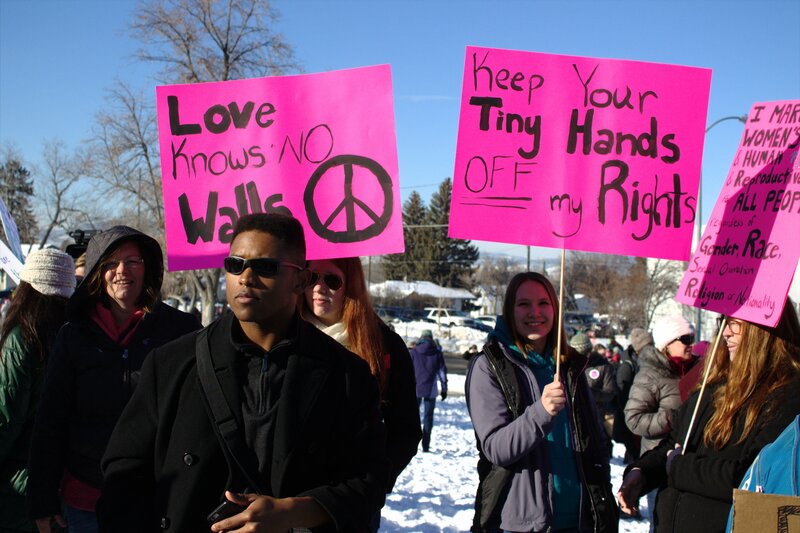 Nine students and one staff member from Rocky Mountain College traveled to Helena to support the movement. From the moment they joined the crowd at the Capitol Building they felt the positivity, unity, and strength that was circulating in the air. A plethora of vibrant signs could be seen in the sea of people. Some read “I am not free so long as any woman is unfree”, “Black Lives Matter”, and “No one is free when others are oppressed.” For some, it was an overwhelming but positive experience that brought tears to the eyes. The march began at 12pm and the thousands of supporters gathered around the Capitol Building to rally. By the time RMC students arrived, the speeches were already underway. The students arrived just in time to hear the Montana Women’s Chorus sing “A Woman’s Voice”, a tribute song to Jeannette Rankin. Rankin was the first woman to serve in Congress and helped pass the 19th Amendment. Speeches followed the chorus, including one delivered by Rachel Carroll Rivas, the co-director of the Montana Human Rights Network. Her speech focused on human rights and how they should be universal. Rivas delivered her speech with a strong and powerful voice stating, “My dreams are as big as the earth itself and as beautiful as this crowd. But it is not my dreams that will change the world, it is the power of collective action, smart strategy, informed positions, and persistent effort. You are my network and my people. You are the list makers and molders of activists tomorrow. You are friends of the fearless immigrants, the children of the people who pave the way for today’s resistance. You are the schemers and the dreamers that will make tomorrow a better day and human rights a reality for all people.” Cheers and applause erupted almost every time Rivas paused. Respect was one of the main themes of the protest, regardless of who was speaking. Shortly after Rivas spoke, Michelle Mitchell, a member of the the Confederated Salish and Kootenai Tribes, addressed the crowd. In her speech she advocated for Native Americans and education. Mitchell proclaimed, “I am marching because it is time to take action, being passive is no longer an option because that is how we got here. I spoke about education because that is what’s going to make a difference. We’ve got to educate young people so when they grow up to be adults, this won’t happen again. The only way we will be successful is if we come together,” shared Mitchell. Mitchell was not the only Native American woman to speak out on issues. Janna Weaselboy-Caplette spoke out about Standing Rock and the symbolic importance of what water and land mean to Native Americans. She stated, “I personally felt a need to go to Standing Rock and stand my ground and protect the sacred, which is our water, indigenous land, sacred burial sites and tribal sovereignty.” Lauren Small Tsitsistas, who was one of the first Northern Cheyenne women in the U.S Coast Guard, was another Native American woman who spoke out about Standing Rock as well as women’s strength. Following each speech about Standing Rock, tribal songs were performed. The first song’s meaning was to bring people together and was referred to as a “people’s song”. The second was a song that praised women warriors. While the title of the march was called the Women’s March many men from all backgrounds joined the movement and served as strong allies. One of those allies was sixteen-year-old Nicholas Beye’h who traveled from Missoula to march. Beye’h marched in order to express solidarity with the movement. He shared that he was marching because he has sisters and younger generations of women in his famil. “I want to be able to share with my grandchildren and future generations to come that you don’t need to be a woman in order to stand for women’s rights. You can be there to support them,” stated Beye’h. He went on to say, “I want to be that role model for my family because there are things that need to be positively changed.” He even missed a wrestling meet to support his family and stand up for what he believes in. Beye’h identifies as a young activist and even traveled to Standing Rock last year. He was proud that he was being active about his beliefs and not just voicing them on social media.